I don't know, because he did make it look so easy. My initial inclination is to say "No", but then I think I'm being a colossal soccer snob, so I say "...maybe?" I feel like, for a non-watcher, a curler from distance or a run where you beat 5 players would be more impressive. Another thing about the Barca-Betis game: Every goal was amazing. Every one. Messi's free-kick, which is absolutely fantastic, is the worst of the goals scored in that game, which is insane. 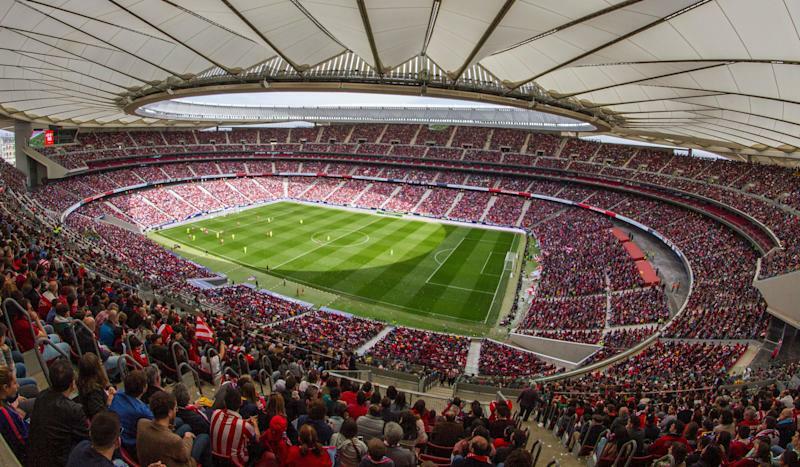 That's 60,000 people filling the Wanda Metropolitano to watch Atletico Madrid take on Barcelona in women's football. Barca won 2-0, but I thought it was pretty damn cool. It's not a permanent change or anything, the Barca coach said after the game that they've played infront of crowds of 30 this season, but it's a start. I had no idea things had gotten this bad at Bolton. I didn't mean it out of elitism, more just a curiosity how it looks to others. I asked one person today. A non-soccer friend gave it a 6 out of 10. That was the extent of my research. Based on your single sample survey then, you're right, because it's quite genuinely a 12/10. Based on your extensive research then, you're right, because it's quite genuinely a 12/10. Why would I continue research when I already got a result that supports my hypothesis? That's just asking for trouble. It's always good comedy relief to read the best/worst signings of the season puff pieces that come out once we are 3/4 into the season. One that made my day. Worst, Spurs: didn't make any signings. I genuinely can't tell if England is very, very, very good, or if the Czechs are just that bad. It’s both, probably. On the one hand it’s their worst loss ever I think which means it’s an anomolous scoreline for them. On the other, I couldn’t name a player on the Czech side now that Rosicky and Cech have aged out of it. Which is not to say my knowledge of football players is a measure of anything other than, well, how many of their roster are good enough to get picked for a PL side? how many of their roster are good enough to get picked for a PL side? The guy who scored the fifth (and now has more England goals than Jordan Henderson), plays for Bristol City, so not him apparently. Admittedly he's on loan from Chelsea, but isn't everyone? Which is not to say my knowledge of football players is a measure of anything other than, well, how many of their roster are good enough to get picked for a PL side? I had not noticed that Scotland lost to Kazakhstan 3-0. Over the last 10-12 years or so, following qualifiers to either the Euros or the World Cup has, for England supporters been full of dull, drab games featuring a lot of laboured effort and undue struggling to overcome opponents just not as good as the game, and so perfectly happy to put 11 men in defense and make England work for their victory. To be sure they'd get the win, by my word they were terrible matches to watch. Oh to be a team like Spain or Germany and ruthlessly put down any team in their way as quickly and efficiently as possible. There's more of a touch of that now with this young Southgate team. I thought we were a little lucky to get as far as we did in the Russian world cup, but now I'm starting to think that maybe luck wasn't as big a factor as I thought. I hope to God these players don't get crushed under the relentless hype machine the English sporting media is about to become. This is the best I've seen England play since the 1996 Euros. They do look really, really, really good right now, but yes, the England hype machine is going to get ramped up into insanity, at this rate. Also, kudos to Sterling for stunting on the haters* after the 5th goal. * - we are being incredibly kind with the euphemism here. I wonder when we'll hit a tipping point RE: soccer and head injuries. Fabian Schaer's head collided with the skull of Georgia's Jemal Tabidze as both went for the ball in the 24th minute of the match in Tbilisi. Schaer lay unconscious on the ground, his tongue obstructing his breathing. Georgian player Jano Ananidze rushed to his aid, using his fingers to try to free Schaer's airway. Schaer recovered quickly after further treatment from Swiss first-aiders, Swiss daily Blick reports, and was able to continue playing, helping set up Switzerland's second-half goals for their 2:0 victory. "It looks awful. I can't remember anything," the Newcastle player told the paper after being shown video footage. "I was out for a few seconds. My skull is still humming. And I've got neck ache and a bruise on my forehead. But it was worth it." So here's a ridiculous realization: This is a situation where you can quite reasonably say that the NFL is more progressive (or, if you really wanted to get salty and dumb, more "soft") than soccer. I shake my head all the time at concussion protocols in pro soccer. They are a joke. For youth soccer here in the US, coaches have to go through concussion awareness training certification and there is a high level of sensitivity to it. It's mind boggling to see how it's essentially completely ignored at the sport's top levels. Having an independent medical specialist perform evaluations for suspected concussions would help, rather than leaving it to the club's own trainers. Also, allowing free substitutions for concussed players, and allowing temporary substitutions during the concussion evaluation time for suspected concussion injuries would help too. I agree that soccer needs to be better about concussions, but I know that the very day that free concussion subs are allowed, they will be abused. Soccer is already rife with fake injuries, and I'd hate to incentivized more. I do think your idea of a temporary sub during an evaluation has merit, but that (and the idea of a free full sub) makes concussions their own unique injury, and I'm not sure they should be. Right now, if a guy has his leg intentionally broken in an illegal challenge, we don't give a free sub. We might give a red to the other team, but that's neither guaranteed nor a remedy for a team that may now have a very imbalanced ten (consider if it happened to a goalkeeper with zero subs left). That's a bad situation, and always has been. Maybe someone can come up with a solution that would encompass that situation and potential concussions, and hopefully without leaving the door too wide open for abuse. It's an interesting discussion, for sure. I'd argue that concussions are a unique injury, in that a player can often play through them but with risk to long term cognitive function. With other injuries that remove a player, the player simply can't play despite wanting to. My first reaction would be that teams may abuse the concussion rule, but I'm not sure that would be the case if the determination surrounding the injuries and tests were left in the hands of independent officials. So there would need to be clear evidence of head trauma, then the independent medical official would rule a stoppage of play, pull the player(s) off for evaluation, at which point a team could sub on a new player. If a concussion is determined, the player is not allowed back into the match and must go through concussion protocol before being allowed to resume training and play. That could be many days, so "faking" a concussion would usually be a bad strategy from a tactical perspective. If a player is determined to be able to continue, then at the next stoppage of play they are allowed back on while the subbed player is removed from the game. Maybe substitution rules are modified to allow for 3+1 subs, but the fourth could only be brought into play if there were a concussion injury. I like your take, especially if they mandate several days of rest after a concussion sub is made. That could help make it less of a temptation to cheat. I'd like to think a good system could be put in place. It might not end up a perfect system, but it shouldn't have to be perfect. It would just need to be better than the current awful system that has pro soccer players with concussions continuing to play in games. Given all we know about head injury, it's shameful that pro soccer doesn't address the issue. Well, it's being addressed like FIFA addresses every problem, which is at best haphazardly. Harry Kane is making plans for a move to the United States after his Premier League career ends, although unlike David Beckham, Zlatan Ibrahimovic and Steven Gerrard he may not play in MLS. Eh, go for it Harry. It'll be interesting at the least. If I'm watching Harry Kane kick fgs in 10 years... Well I dunno. I'll just be flabbergasted that I'm in some Bizarro world. Ole Gunnar Solskjær’s appointment as the permanent manager of Manchester United will have the knock-on effect of leaving the Liverpool defender Virgil van Dijk without a place to live. Anyway, not really a surprise. I thought it was in the bag after the PSG game. Hopefully he's now the Tottenham Manager-For-Life. Cardiff were absolutely robbed this afternoon. Anyone who thinks VAR isn’t the answer is 100% wrong. Sure it needs to be used and applied properly but that first Chelsea goal was so offside, and official failing to spot it really shouldn’t be officiating. Might well cost them relegation that. I’m trying so hard to be non-partisan in this thread and be realistic about our chances of winning the league but my god, Liverpool had no right to win the game against Spurs but somehow we got the ball - rather, Loris screwed it up a bit - over the line and got the win. We keep doing that and how knows? Watching us play now is anything but pleasurable. Every ball is wince inducing, every missed absolute torture. IF, and if Liverpool do beat Man City to the Premiership this season (I still think we might fall short) it’ll be one of the greatest achievements in the Premiership era. City really should be out of sight. The fact we’ve stayed in touch is a miracle all by itself. There are 11 points between 7th and 17th this evening. There are 16 points between 6th and 7th. Liverpool absolutely could've lost this game, although I thought it was fairly even and they had several great chances to go up 2-0. I don't believe in omens, but the only team left on their schedule who should be able to beat even a half-competent Liverpool right now is Chelsea. The rest, they should win. Then again, Chelsea has fairly recent previous when it comes to screwing up someone else's title chances. Absolute gut-punch of a stupid own goal today, and you have to give the blame to Lloris. Still, he saved the very strong header by Salah. Sometimes the ball doesn't bounce your way, I suppose. Absolutely beautiful build up to the goal by Lucas. I have never understood people who are against replay. A slightly (but only slightly, because there are huge pauses for disputes and dives and all kinds of stuff already) more fluid game is not worth these huge, game destroying errors. It's funny that soccer has resisted replay the longest, and yet has the least scoring, and so stands to have more game-changing incorrect calls. Liverpool-Tottenham was high drama, for sure! I thought a draw would have been a fair result. Liverpool had the better first half; Tottenham flipped it around in the second.